Last night we went out to Cryin’ Coyote Ranch for team sorting practice and chased some cows. At no point in my entire riding history (or life) would I have ever imagined that this is something I would one day do. There are cows, numbered 0–9, in two small round pens that are connected with a pretty wide opening between them. The cows are all herded into one of the round pens, and two riders are in the empty one. As the first rider enters the pen with the cows, a number is called out, say “5”. The rider must separate cow #5 from the herd and put him in the empty pen. Her partner guards the opening to ensure that only cow #5 goes in there, and that he doesn’t come back out. Then the riders switch off cutting and guarding the cows in order — in this case, #6, 7, 8, 9, 0, 1, 2, 3, 4 — until all the cows are in the second pen, or until time runs out. You only have a minute to achieve this. In none of my five or so turns did my partner and I get all the cows; I think our record was four of them. The major achievement of the first turn was not getting bucked off by Dunnie, who despite being a finished reined cow horse, gets so excited about the cows that he doesn’t know what to do with himself, gets frustrated by it, and then prances and jumps around while the cows ignore him. The second time around, I was able to get him to go after the cows, but we spent the entire minute chasing cow #5 while he ran us in circles around the ring ensconced in the security of his herd (at times with his head literally under the back legs of the cow in front of him) and I laughed my head off. But the third time! Let me tell you, getting that first cow in the pen was a thrill. I imagine it’s what hockey players feel like when they score their first NHL goal. After that, I realized that making Dunnie wait in the line for our turn was ratcheting him up, and that if I cantered him around the warm-up ring in between, it’d give him something to think about and he’d cool himself off. I also had him doing spins, and with his elevated energy levels, we did some of the best ones we’ve ever done. Our next couple turns after that were much more productive. Every time I either got a cow in the other pen or successfully blocked one that wasn’t supposed to come in I felt like pumping my fist in the air and cheering (I mostly restrained myself, but I’m told my face was lit up like the sun). So the upshot is, now I’m addicted to this. Once he gets past the silliness, Dunnie is actually a pro. And as I’m gaining confidence, I can be more aggressive chasing those cows down. It’s quite exhilarating to ride right into a herd of cows and then be able to control them. It makes me feel pretty powerful to be able to push around cows, even though they’re little cows. The level of partnership and communication between horse and rider required for this is more than anything I’ve ever experienced. It means moving together as one toward the same purpose. As always, the tangible is more compelling to me than the abstract. I can certainly get behind working hard to get good at doing stuff in the ring and then winning competitions. But this is about as far from abstract as you can get. Horses are real. Cows are real. They are both big, and very vividly alive underneath and surrounding me. The more I delve into all the different disciplines of riding, the more I see how there are so many ways to challenge myself and my horse. It’s like when I was taking English lessons, I saw some shiny stuff on the ground — and then when I started riding Western, I dug into this mother lode of possibility, where the deeper I dig, the richer it becomes. Over the last year, Dunnie has been a great teacher, helping me learn all the new tricks I’ve picked up as a Western rider. 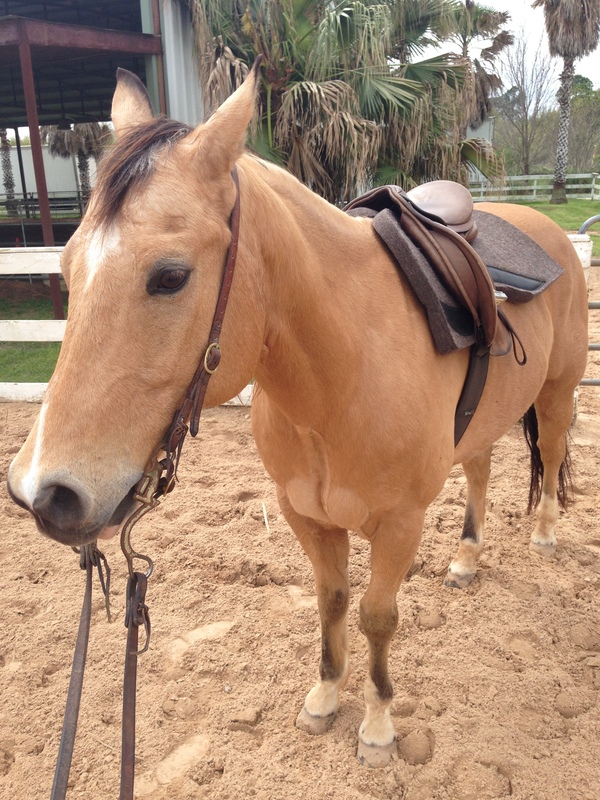 I thought it was about time that I returned the favor, and last Friday I decided to put an English saddle on him. I’ve only ridden English twice in the last year, both times on horses that were not Dunnie, and both times I was struck by how much more work it is than Western. 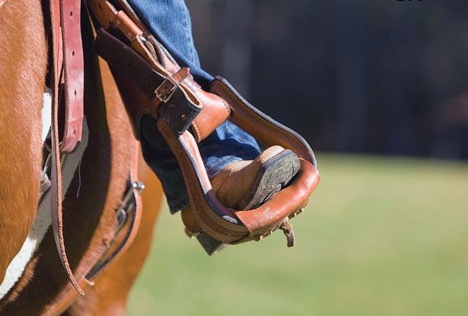 There’s so much less saddle to hold you on your horse, and the stirrups are less attached to the saddle, providing much more opportunity for your leg to swing all over the place. So in addition to not knowing how Dunnie would react to the different saddle and style of riding, I really didn’t know how my own body would react to it. I predicted that I’d be pretty sloppy. Amazingly, that wasn’t the case. First, Dunnie is the best. He reacted so well to the change, even naturally adjusting his stride and movement to my different style of riding (posting at the trot much more, a little more forward center of gravity/arch in the back, etc.). I have to imagine that the significantly reduced weight of the English saddle was like a vacation to him after the serious heft of the Western saddle I ride in, but even so I was so pleased at how quickly he adjusted. As for me, I was very pleasantly surprised by the strength and stability of my legs. Riding Western, I don’t grip as much with my upper calf as I do in an English saddle — it’s just not possible with the way the stirrups are — but I do use my legs a ton to tell Dunnie where to go and to move him laterally. I’ve also been making a serious point of adding exercise into my rides; I’ve been forcing myself to do a lot of two-point at the trot, posting with no stirrups, and a two-beat posting exercise that means you stand up for two beats, sit for two beats (up-up, down-down), which is a lot more difficult than it sounds. I was able to see the results of all this work in the English saddle, where even at the canter, my leg was rock solid. It just goes to show that constantly going back to the basics in riding is important, no matter what level you’re riding at. I’m constantly reminding myself of fundamentals to work on in my own riding, now that I’m teaching and correcting the kids on these basics over and over. I think now that I know he’s all right with it, I’m going to add to that exercise regimen one biweekly English ride to provide cross-training to both myself and Dunnie. Now that we’re making some real breakthroughs in our Western riding, including getting him to carry his head much lower than before and finally finally getting some good turnarounds, I’m motivated to keep pushing him, to see what else he can do. While Western is still our main focus, throwing in a little English now and again will be good for both of us just to keep it interesting — a bored Dunnie is a troublemaker Dunnie — and who knows? We might just try out some English classes in addition to the Western ones at our next show. A couple of things have recently somewhat derailed any efforts at training: 1) the insanely demanding, all-consuming juggernaut of the holidays and 2) some soreness/lameness for Dunnie. The holidays had their nice moments, of course, and I enjoyed spending time with family. But the “holiday season” seems to keep getting longer every year, and it’s gotten completely out of hand. It really feels like it starts in September now, when everyone starts freaking out about pumpkin spice. And then the month-long marathon of Christmas music on the radio begins the second after Thanksgiving and it’s just a countdown until I can have my life and my 80s music back. The other thing I’ve recently gotten back is Dunnie. Starting a week or two before Christmas, he started acting strangely. We had noticed that there were potentially some pressure points from the saddle I was using, although he was acting fine, and decided to try a different one. That went poorly. I tried three other saddles, all of which seem to make him PISSED, and then went back to the old one only to find that he was still not himself. At first there was no obvious lameness. He was certainly stiff, particularly when tracking right, and especially on circles. He was usually just fine at the trot, but ask him to pick up a canter and he would kick out on the left, and wouldn’t be able to smoothly pick up the transition, sort of rearing back a tiny bit with his head high to lope off. Then at the canter, he was constantly switching leads in back. And ornery. He was uncharacteristically ornery about all of that, which is what tipped me off to that fact that he was in pain and not all of a sudden acting out just for fun. Then at my lesson on the Thursday before Christmas, he finally turned up lame. His back left was really stiff and it was apparent after trotting him just a few steps. I ended up riding a different horse that night in my lesson — a big, sweet, calm ex-racehorse named Chrome — and riding English for only the second time in a really long time. It was fun, but strange; it’s amazing how much less secure an English saddle feels. And I’d forgotten how much work it is! I think I just assumed that riding so often has gotten me in much better shape, but nope. Western is just way, way easier. Anyway, I ended up giving Dunnie some rest over the holidays, and then my trainer contacted a Pulsed Electromagnetic Field (PEMF) therapist . There’s a good description of what this is on their Facebook page, but essentially it is a machine that pulses a magnetic field through the body, stimulating cells and increasing oxygenation, reducing inflammation and promoting faster healing. I was there when they came to work on a bunch of the school horses, and the therapist (who also treats human clients), put the machine — which looks like a vacuum hose bent into an oval shape — on my back to see what it feels like. I could feel it all the way through my stomach. It was kind of intense, not altogether pleasant or unpleasant. In the places where there is particular pain and inflammation, the muscles sort of twitch in little spasms. This is very clear on the horses, whose muscle groups are large and easy to see. When she treated Dunnie, I wasn’t around, but when I spoke to her after she said that he’d had a lot of soreness all over his body, and particularly on the left side, which jived with what I’d been experiencing. I’m not really sure what made him like that. One theory was that removing his back shoes put him out of whack (the farrier came right after Christmas and put them back on, and that seemed to help a bit). Another was that he’d pulled something when we tried to work on slides. Yet another was that the cold temperatures were bothering him, making arthritis that we didn’t know about in the warm months act up. We just didn’t know. While Dunnie could communicate to me very effectively that he was in pain, he couldn’t tell me why. Luckily, the PEMF seems to have worked like a charm. Since he had the treatment about two weeks ago, it feels like I have my old Dunnie back. He’s moving much better, doesn’t display the same stiffness, and is visibly happier. I’m so relieved that it doesn’t seem to be a bigger issue or serious injury, and that he’s clearly feeling much better. It’s a terrible feeling to think that your horse is hurting and that it might be because of something you asked him to do. Especially because Dunnie, champ that he is, would do it anyway. When I first noticed something was amiss and I was putting him through his paces to try to identify the problem area, he’d tell me “that hurts!” — but he would still do what I asked of him. Now, with all that distraction out of the way, it’s time for us to get back to the work of training. We’re working on a new pattern that incorporates pretty much all of the skills we need to use for anything we want to do. It has side-passing, lead changes, circles, backing, spinning — you name it. It feels good to be focusing again, and working toward getting better at things we’ll use at a show. Dunnie is at his best when he’s mentally engaged in what we’re doing, and so am I, so we’re about to start having lots of fun together again. New Views and a New Look! As promised a couple of weeks ago, Urban Equestrian now has a new look! The blog just turned four years old this November (which also marks four years back in the saddle for me), and I thought it was about time for an updated design. Last weekend, Dunnie and I also got a new look at the world as we went on our first trail ride together. 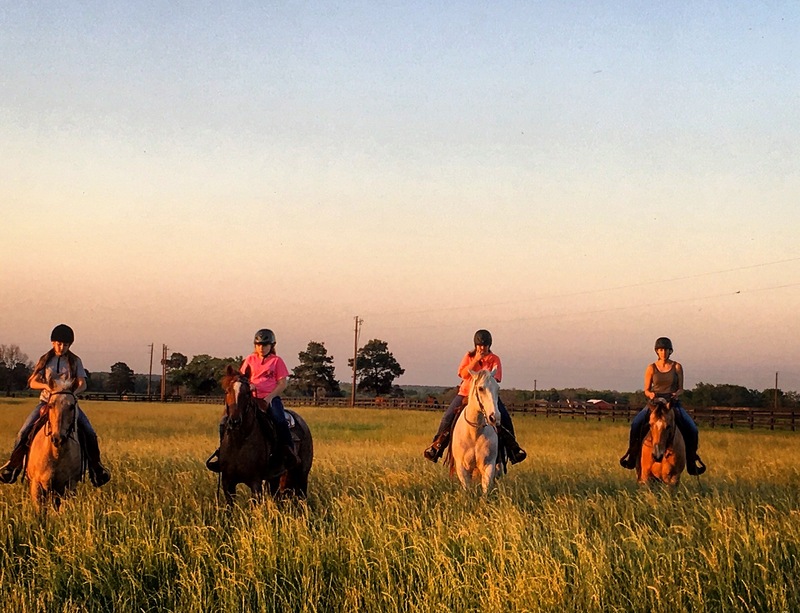 My trainer brought us, along with six other girls that I ride with and their horses, out to 7IL Ranch to practice riding on trail and see if we’re interested in doing some competitive trail riding. 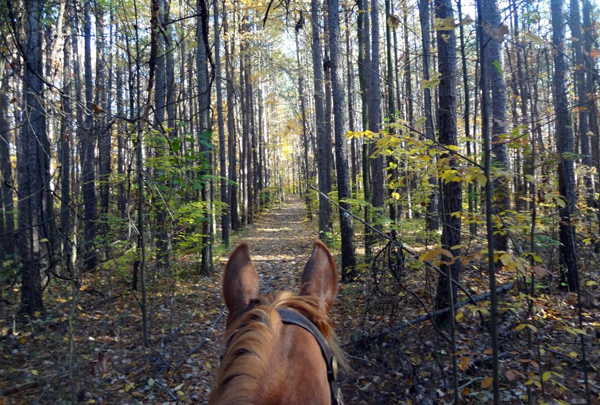 A new view between the ears as Dunnie and I head out to the trails at 7IL Ranch. Dunnie and I did a trail class at the SHOT show we went to in September, but that was different; it was trail obstacles laid out in a ring. Back in college, I did one competitive trail ride that was actually on outdoor trails on a lark (in an English saddle) and really enjoyed it, so I’m interested in doing it again. Competitive trail riding is a set of obstacles spread out along trails, maybe about a mile apart. They can include elements such as riding over a bridge or through a stream; opening, going through, and closing a gate; riding up to a mailbox and taking something out or putting something in; or riding up a hill without letting your horse break into a faster gait than a walk. The competitors ride through the trails and are judged at each obstacle; there are three levels of difficulty available at each stop, with more points awarded for the higher difficulty skills. 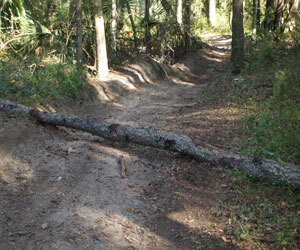 This weekend on the ride, we didn’t encounter any man-made obstacles, but we did find some of the ones that crop up naturally on trails: fallen trees to jump over, ditches that make the trail narrow and steep, branches to avoid (or to barrel through, oblivious to the fact that you have a rider on top of you, whichever). I was interested to see how Dunnie would react to being out in the open. During the SHOT show, he had reacted poorly to the trail class and the ranch pleasure class being outside near a wooded area, but I had to chalk some of his being so keyed up to all the excitement of being at a show as well as my own contribution in the form of performance anxiety. 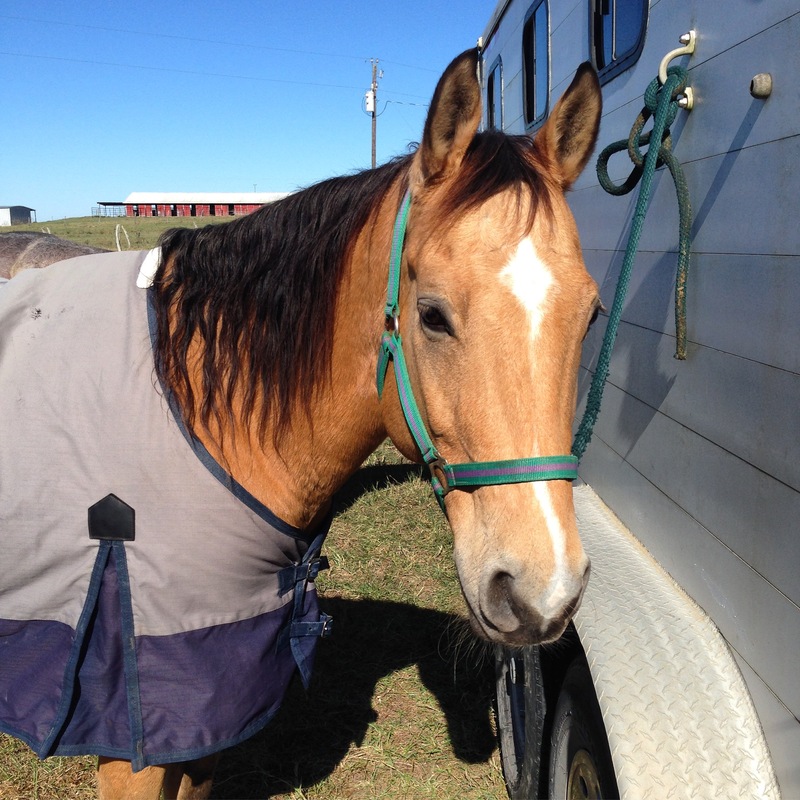 I predicted that he would be excited to be out on the trails and might be a bit alert, but I also knew that since I had no goals other than to relax and enjoy the ride, I was confident I could keep him calm enough for that. Right off the bat when we got the horses out of the trailer on the open field in the picture above, he was super alert — but that was because next to that field was a pasture full of his favorite thing in the world, cows. As I trotted him around trying to get a feel of how the open space would affect him, he kept craning his head back around to look at them like a dog that wants to chase a squirrel. He cracks me up. Once we got away from the cows and out onto the trails, he was able to focus a bit more. At first, all the tall grass along the side of the trail was a potential threat that required his complete vigilance. Aware that when he does shy away from scary things, it’s a lightening-fast move where he drops his shoulder — the speed and the sudden imbalance being a tricky combination to stick with as a rider — I had to consciously work to remove anticipatory tension from my body. Once we left the more open trails for the narrower, wooded ones, he relaxed a bit of that vigilance. I think that was mostly because there he had something to think about, being forced to negotiate the footing more attentively. His main concern for the rest of the ride was whether the lead horses in front of us were getting too far ahead for his liking. My tendency in a trail ride is to want to be in either the front or the back. If my horse isn’t a leader, I like to ride all the way at the back so I can keep track of everyone (this is probably a holdover from hiking with a bunch of kids in my camp counselor days). Dunnie would certainly have enjoyed being the leader, but would have quickly gotten out of hand had I let him. He would not tolerate being towards the back, and even when he was comfortable in the middle of the pack, we had to be cognizant of train getting too spread out or he’d start to get charged up. Overall, we spent pretty much the whole six-mile ride in an energized, but contained, trot. At first I kept trying to bring him down to a walk, but I quickly realized that this small release of energy would keep him happy, whereas trying to tamp it down completely might result in an explosion later on. Luckily, his trot is very easy to sit. And even more luckily, he was willing to communicate with me. Often when we start our ride in the ring, I have to take a few minutes to get his attention. He’s excited or distracted by other horses, by the wind, or some birds, and I need to say, “Hey, listen to me now. We’re gonna do stuff.” Since we’re in a ring and in familiar surroundings, the distracting things quickly recede and after a few minutes, he’s ready to give me his attention and get to work. The big question for me in taking him out on this trail ride was whether I’d be able to get his attention in a more chaotic, more interesting, potentially scary out-in-the-open situation. I remembered the helplessness I felt at the SHOT show when it seemed that I just couldn’t get through to him. Ultimately, he came back to me for the afternoon classes, but those had been back inside the arena, not outdoors like the morning ones. But since then I’ve continued to develop as a rider and every day I feel more confidence. And so much of the detailed work we’ve been doing — especially on flexion — has focused and refined our communication. I was extremely pleased to see that even though he clearly just wanted to run amok through those trails — to charge ahead of everyone else, freak out about figmentary predators in the grass, and probably charge back to the trailhead as quickly as possible to bite some cows on his way out — that he was willing to listen to me when I said that we weren’t going to do any of those things. I was excited to go on that trail ride because being out in nature is restorative and calming for me. I love hiking and it can only be made better by being on horseback. I didn’t exactly get the relaxing ramble I was hoping for, but what I got was much, much better. I got to see that Dunnie trusts me and that I can trust him. I am what one might call a “minimalist” rider, in that I like to ride with as little tack and as few extra tools as possible. It annoys me to carry a crop. I do not want to deal with an extra set of reins. I won’t ride with a martingale unless I absolutely have to. And for pretty much my whole life, I’ve managed to avoid spurs. Much of this preference stems from just liking to keep things simple. Why add stuff on that you don’t need? But there was also an underlying feeling that if I couldn’t get the horse to do what I wanted on my own, using only the aides that come from my body, then I didn’t deserve to call myself a real rider. I realize now that this is dumb. It’s the same self-bullying nonsense that I was putting on myself when I came back to riding four years ago in Brooklyn, when I was fighting the anxiety of riding a horse through a traffic circle and into a city park and I thought that dismounting when I felt unsafe was admitting weakness that meant I’d never be strong enough to succeed. In the last couple of weeks, I’ve been working with Dunnie on some more subtle challenges — getting some more vertical and lateral flexion (making his head carriage more supple and soft), and making distinctions between responding to my leg asking him to move different parts of his body (his shoulder for a spin; his side for a side-pass; and his hip for loping off on the correct lead and getting flying changes). I’ve also been working on slowing him down at the lope so that we can really make a marked change between our big fast and our small slow circles. One of the biggest challenges in the head carriage and the speed control endeavors has been that it requires me to use a lot more rein than I usually do. In keeping with my minimalist riding sensibilities, I also typically aim for using as little hand as possible. But that’s just not effective here. And unfortunately, when using enough rein to get Dunnie to do what I want him to do (hold his head correctly, or slow down at the lope), the side effect is that he breaks gait, or if we’re walking, just stops entirely. At the lope, that has required a tremendous amount of leg effort to keep him going, and finding the balance where we aren’t stop-and-go has been mostly elusive. My trainer suggested spurs a while ago. I wasn’t as closed off to the idea as I would have been before, but I didn’t have the right kind. When I started riding here my first trainer suggested that I get a pair — but the kind I got, while pretty minimal, still had a rowel, which is the spiky, revolving disk at the end that you see in all the cowboy movies. 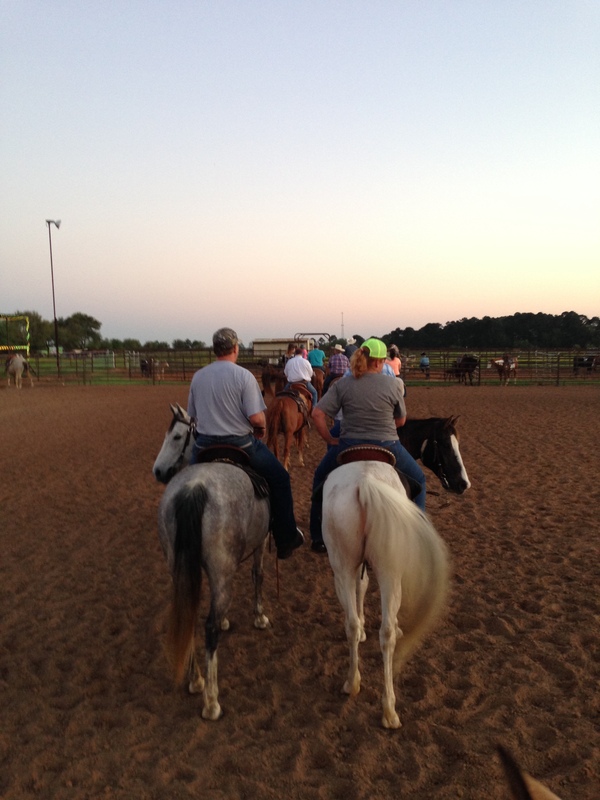 Mine had a dull edge, but nonetheless, the couple of times I’ve tried riding with them, Dunnie got pretty agitated. I didn’t feel comfortable with them. 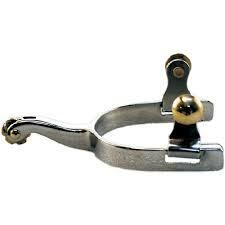 But this week I finally got myself a different kind — a ball spur, without the rowel. These have a rounded, dull end that is much gentler. It feels more like a thumb pushing into your side and doesn’t have the pinch potential that even the dull-edge rowels have. Last night I rode with my new spurs for the first time. They take some getting used to. You don’t want to use the spur every time you put your leg on the horse, so I’m having to learn to feel where the spurs end in relation to my bootheel. I’m also really conscious of trying to use them as subtly as I can so Dunnie doesn’t become inured to the sensation. But using this new tool led to a really great breakthrough. Before, using my reins effectively to get the right head set meant that my natural leg aides (my legs) were not enough of a counterbalance. Now, with a very very slight touch of the spur, I can tell Dunnie that even though I’m pulling on the reins, I don’t want him to stop — I just want him to round his back and push off with his back legs to keep going. When you’ve been trying and trying and just not getting something right, it can certainly be frustrating. I’ve learned a lot of patience since starting this new discipline, realizing that the horse isn’t going to do something perfectly the first time you ask for it, just like it takes people a lot of practice to master a skill. So I don’t get wound up or upset about it being difficult, or taking longer than I expect it to. But I have to say, that moment when all of sudden you do the tiniest thing differently and it all magically comes together — where you get it, and you also can tell that your horse gets it — in that moment, all the work and all the frustration is completely worth it. In the post-first-show universe Dunnie and I now inhabit, we’re working on refining some of our technique — particularly, softening and lowering Dunnie’s head carriage. The result of this is that his whole body is carried differently: his back rounds and his legs come underneath him more, moving the propulsion from the front legs pulling him forward to the back legs pushing him forward. At first, this change felt a lot more comfortable, especially at the canter. The horse is a lot more collected and has less opportunity to get strung out, so it’s easier to sit. However, I noticed at the trot that I was feeling a lot more bounced around than I had been before, and was having a more difficult time sitting deeply in my saddle. I came across an article about correcting common leg, seat, and hand problems and one of the fixes mentioned was stirrup length. Having ridden English most of my life, one of the biggest adjustments I had to make to the Western saddle is the stirrups, both their clunky size and their typically longer length. I’ve been riding with mine on the shortest setting to make myself comfortable, and if I look at myself objectively, my legs do look a bit incongruously crunched up like I’m about to go jump a course in a Western saddle. Thinking about it now, I’m sure that’s contributing to my continued struggles with arching my back too much, and I also suspect it’s causing me to sit with my weight more forward in the saddle — which, in turn, may be making Dunnie more apt to carry his head higher. So recently I decided it was high time that I put my stirrups down to a more reasonable length and moved them down a hole. Now they fall where I don’t have to lift my leg up to reach them, but can just slide my toes right in. The first few days that I rode this way were a bit difficult. I felt less secure in my legs, and afterwards could also feel the soreness in some of my interior thigh muscles that I haven’t felt for months. But I’ve been riding with the longer stirrups for a couple of weeks now, and I’m finally starting to feel the payoffs. That happened the other day when we were cantering around the ring, and I could feel Dunnie’s back rounded, and I could feel myself perched up there, my balance and my posture so different than before. 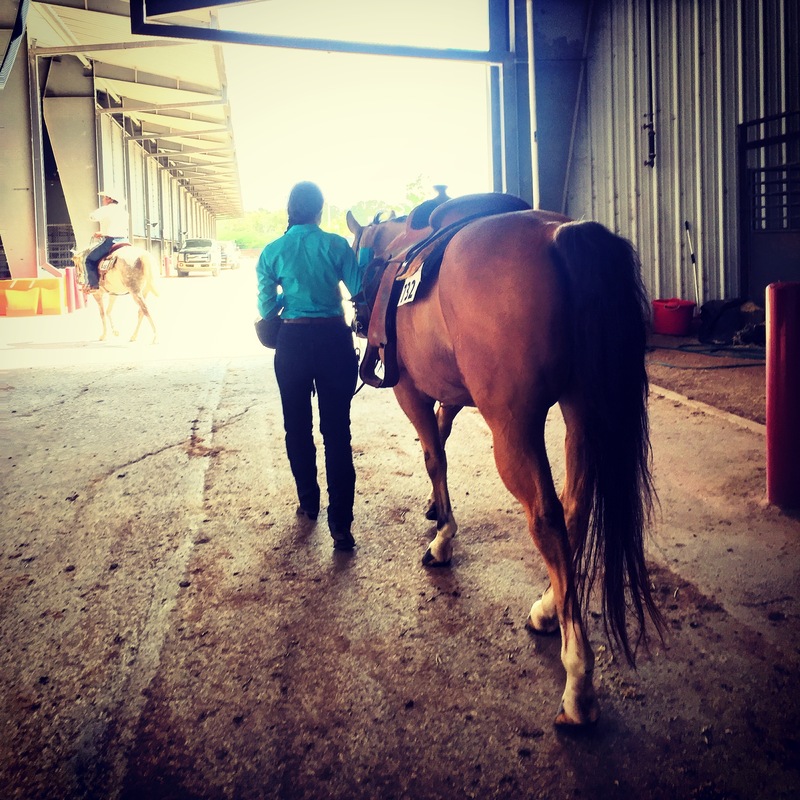 My legs feel longer and my weight in my heels counterbalances the weight of my upper body; I don’t have to grip with my knees or my calves to stay with the motion of the horse — my seat does that naturally. My back isn’t arched anymore, and whenever I find myself falling back into that habit, it’s immediately recognizable because it’s so uncomfortable. When it’s arched, I can feel the impact of hitting the saddle on my hips and my spine. When my lower back is tucked, the ride is so smooth that I could canter all day. So lately it’s been more about little adjustments that at first are frustrating, but are ultimately leading to big wins. Speaking of adjustments…I’m working on a new look for the blog. Hoping to roll it out in the next couple of weeks! Two weekends ago was my first horse show and it has taken me this long to recover from it, let alone write about it. Sitting down to write about it now, I almost don’t know what to say. Mostly because there are too many things to say. It was an intense, exhausting, instructive, surprising, and joyful experience with a lot of ups and downs. 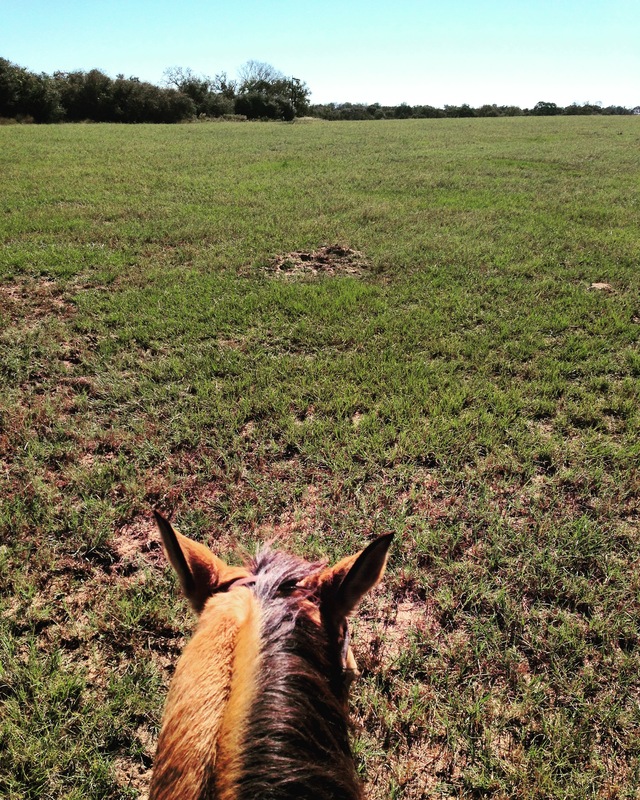 I learned things about riding, about Dunnie, and about myself and felt my brain come alive as it connected concepts from all over the place: my own experience, things I’ve been taught in the past, and disparate things I’ve read. The clinic was awesome; in ways I enjoyed it better than most of the actual show. I was in the saddle pretty much the whole day from 9 a.m. to 4-ish p.m. with a decently long lunch break in between. I was bit concerned about being in the saddle that long, given that I typically ride for about an hour at a time, and by the end of the day I was feeling it — lots of tightness in my hip flexors, especially. But with stretching before bed that night and then again the next morning before the show, I was not too sore for the day ahead. For the clinic, we were separated into groups that rotated through classes that matched the four classes we’d be competing in the next day: trail, ranch pleasure, working cow, and reining. Since three out of those four were things I really hadn’t practiced very much, I spent the day soaking up as much info as I could to try to do well (or, in the case of the working cow class, merely survive). Trail isn’t what it sounds like; it’s not actually on a trail, it’s an obstacle course set up in the ring that represents things you might encounter on the trail, things such as: tree limbs set on the ground like poles that you have to trot or canter over; L-shaped chutes that you have to walk into and then back out of; wooden bridges your horse has to step up onto and down from without hesitating; and a big, metal gate that you have to sidle up to, open, walk through, and close. We had practiced all of the elements other than the gate once or twice in the back ring at the barn, and in the clinic Dunnie did really well on them. When we got to the gate, however, it didn’t go great. He was being very skittish about approaching it, and then I mistakenly opened it the wrong way and we had to start over. Then it took forever for me to get him near enough to open it again. We finally made it through, and then he wouldn’t let me get near enough to close it, and finally Dunnie had enough of it all and just pushed it closed for me with his nose (which is cute, but is not allowed; horses can’t touch the gate). We finished the rest of the course easily. The clinician was really encouraging and started out the whole class by saying that if we made mistakes, we should just laugh them off. So I didn’t get worked up about our troubles with the gate, but I suspected it might be troublesome in the show. I was right, but I didn’t realize how right I was. The trail class was our first class of the day at the show, but it turned out that they had moved it outside to a hill area instead of in the covered arena where we’d had the clinic. Even though it was the first class of the day, I ended up drawing a very high order number so I didn’t have to go for like two hours after I got on and went over there — and it was already blazing hot then. Dunnie had been pretty excited the morning of the clinic, prancing around and whinnying at everyone, and then deciding he should touch all the horses standing around us with his nose all day — but when we did our classes, he had settled down and listened to me. So I thought we were in the clear, that he’d gotten his excitement out of the way the first day and the show day would be fine. When I took him out first thing on Saturday morning to warm him up, he felt great. But the combination of the new outdoor locale for our trail class and so many people around and my own excitement all contributed to him being jacked up beyond reach. I couldn’t get him to listen to me at all; instead he was just looking around at everything and charging around. I had never experienced him acting like that before. I knew going into the trail class that it was going to be a disaster, and it definitely was. Even all the elements that were easy for us the day before went awry. We made mistakes on every single element, all leading up to the ultimate fiasco wherein we couldn’t even approach the gate for what felt to me like 20 minutes but was probably 5 minutes or less. The part of me that knows that you need to school your horse in these situations and just get through the course, and the part of me that was determined not to fail, kept pushing forward and trying to calm him and make it work. But ultimately the part of me that was frustrated and hyper-aware of how much time we were taking when the show was already falling behind schedule, and just feeling confused and a little betrayed by my horse, won out and I motioned to the judge that we’d be bowing out of the class there. Ranch pleasure is a class designed to showcase the movement and versatility of the working ranch-style horse. It’s set up in a ring where there are signs posted at various intervals that tell you what gait to pick up (walk, trot, extended trot, lope, extended lope), and a lot of what you’re judged on is the transitions. Dunnie and I do a lot of transition work at home, and I expected this to be the least challenging class for us. In the clinic, everyone in the group took a turn going around doing what the signs told us to do. Most of the advice the clinician had for everyone was to go faster. He said that the speed that most people were doing at the extended lope was a good speed for the regular lope. His point was that if you pretend that you’re not in a little ring with signs in it but actually out on a ranch, you want to move with purpose so you can get where you’re going. He told an anecdote about a ranch in Wyoming, where a boy was dropped off in the morning and told to ride until he either saw some cows or a fence, and then to turn around and come back. They picked him up at sundown, by which point he had not yet encountered either cow or fence — it’s just that big out there. We did all right in our turn in the clinic, and I was aware of the things I wanted to do better in the show, but I was still the least worried about this class. On the show day, by the time my class time came around, we’d had a couple of hours of downtime from the trail class, and I hoped Dunnie would be more relaxed. Unfortunately, that was not to be the case. 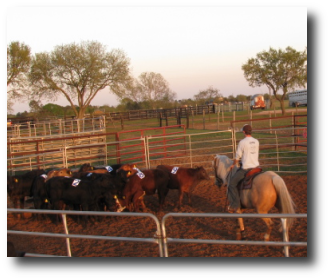 Due to the show falling abysmally behind schedule by this point, they had decided to relocate the ranch pleasure class outdoors to where the trail class had been in order to free up the indoor ring. I tried to ride Dunnie in the warm-up ring, and my trainer even got on and schooled him, but he was still just acting totally out of control. She suggested that I do the class, but ride with two hands in order to school him and try to control him, which due to the rules about riding one-handed with a shank bit, would automatically disqualify me. But since I bombed the trail class, I knew I wasn’t winning any championships here, so I didn’t have much to lose. We were able to get through it and complete all of the required elements — with some extra flair, like Dunnie dropping his shoulder and shying away from some of the signs — and I felt really good about battling it out. I needed a win for myself at that point, because I was going to need a booster shot of confidence going into our next class, the dreaded Working Cow. The working cow class loomed large in my imagination going into this show experience. Direct interaction with cows in my lifetime has been quite limited. I vaguely recall briefly milking one on a field trip to a farm in elementary school, and there was that giant cow that I would occasionally buy treats for at the general store and then feed over the fence at that farm/animal sanctuary/petting zoo/whatever it is that bizarrely exists smack-dab in the middle of a suburban street in my hometown on Long Island. To be honest, I’m kind of afraid of cows. They are big, and I don’t have enough experience of them to understand how their minds work. At the barn we didn’t have any cows to practice on, but my trainer had told me that Dunnie had experience as a cow horse and that he becomes “electric” when confronted with cows. We did spend one lesson with a young girl from the barn pretending to be a cow and running along the fence. Dunnie was confused at first. His demeanor was kind of like, “Wait…you want me to…chase this…child?” and then when I said “Yep” and urged him on, he was like “ALL RIGHT, THEN!” and got really into it. At the clinic, I was quite nervous. I purposefully signed up to be one of the last in my group to go so that I could watch as many people as possible and learn as much from the clinician as I could before it was my turn. The ring was fenced off to be a small portion, where the cow was let in through a gate and the rider attempted to keep him along that wall. The clinician was also in there on his horse talking us through it, and there were other guys on horses that would come in to collect the cow and bring it out through the gate after each was done. Right off the bat when they let all the cows in the ring at the beginning, Dunnie was super interested, which at first made me a little tense. Dunnie reacting to the cows. But as the clinic drew on and I began to understand more of what we needed to do and how to do it, and to get some sense of how the cows were going to react to all of this, I really started to relax. The girls from my barn, who were sorted into another group because they are Youth instead of Novice (like me), were able to come by and sit with me and watch, and having them around made it much easier to lighten up and have fun. They were excited to see Dunnie in action with the cows and we all laughed together about his reaction to them, especially when a rider drove one near the fence we were behind and he put his ears back at the little cow. For our turn, we ended up having a cow that wasn’t too interested in running around. She kind of just went into the corner and I had to keep approaching her to incite her to move so we could then chase her along the fence. Dunnie was a bit overstimulated and kept backing up instead of going forward, but once we got the cow moving I could feel the cow horse I had under me come awake and start to get a sense of his athleticism. After it was done, I was greatly relieved to have survived it, and even felt like I had made some interesting conceptual connections with working the cows and a book I had read about taming wild mustangs (which I’ll save for its own separate post because this one is already becoming novel length). On show day, the relief I had felt after the cow class in the clinic was doing little to mitigate my nervousness. So far, I’d had two classes on a horse that wasn’t listening to me because he was too riled up by his surroundings, and now I was about to put him in the ring with something that demonstrably gets him even more excited. In the show, the ring was not going to be cordoned off — it was the whole entire ring I’d be dealing with, giving the cow ample room to run us ragged. I seriously considered scratching the class for a few moments. But this was what I was there for, what I had gone through the expense and trouble to get to and then sat around in the sweltering heat all day for, to learn and gain experience. So I decided to go in there and set my goal as simply getting through it. I was definitely not, as many of the other riders did, going to chase the cow down the long side of the ring at top speed, no matter how fun that looked. I was going to go in there and do my best to control my horse and hope that now, after several hours in his stall and a thunderstorm that had broken up some of the unbearable heat of the day, he would be ready to listen to me. And for whatever reason, he was. Maybe it was just the outdoor situation that had put him over the edge all morning, and now that we were in a ring he felt more comfortable. Maybe it was my own exhaustion that pushed me past even being capable of exhibiting anxiety anymore, ending the feedback loop of bad energy that had been carried through the reins between us all day. But when I got on Dunnie, he was the horse I know and trust again. And we went into the cow class and did exactly what I wanted to do. You can watch a video of it. It looks really boring, because the cow immediately gives us the slip and we just very slowly and sedately follow him down the ring and collect him. But it felt like a huge accomplishment, and I was incredibly pleased. And now that I’ve done it and survived, I’m SO EXCITED to do it again because when I watch people who are really getting into it, it looks like so much fun. I think Dunnie and I will have a blast the next time we do this. 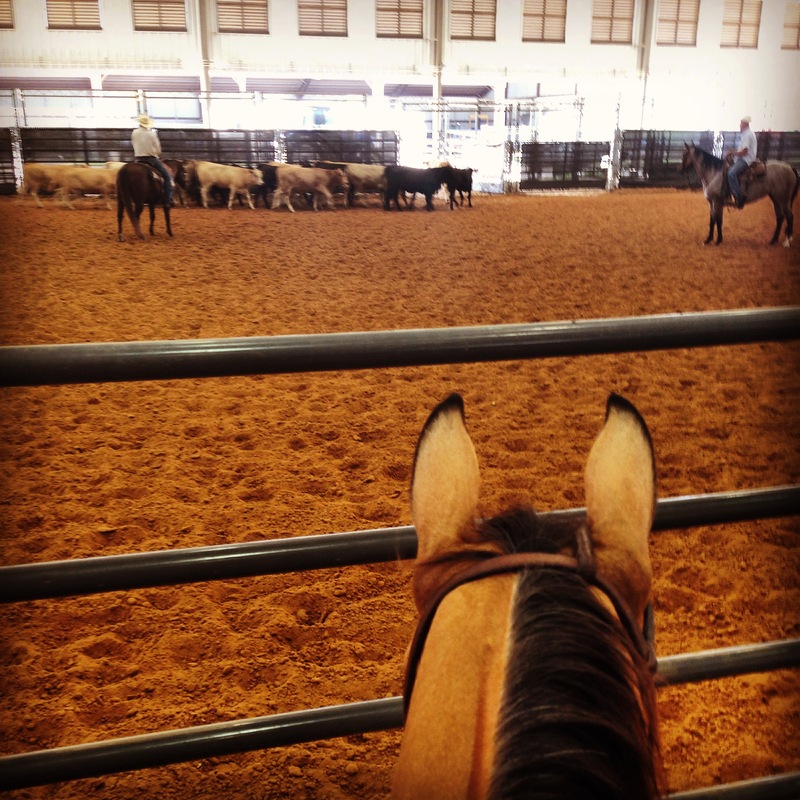 The relief I felt after this class at having my partner back came at a good time — before our final class, and the one that I really cared the most about — reining. 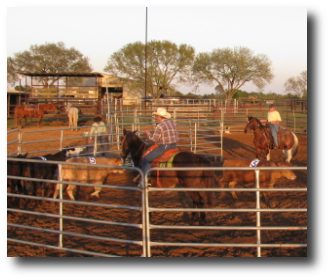 Reining has been the main thing that Dunnie and I practice at home. We had the pattern memorized and had been fine-tuning it for weeks. With the exception of the sliding stop, which we didn’t work on because Dunnie doesn’t have the right shoes for it, I felt we could do all of the required elements and do them well. The reining clinic was very interesting, and extremely helpful in fixing a specific problem we’d been having with our lead changes. In this video, taken the week before the show, you can see that on the left-to-right change (the second one in the video), Dunnie anticipates the lead change and changes his back feet first, goes a couple strides, and then changes his front lead. The ideal is to change them both at once. I brought this issue up with the clinician, and he gave me really good instruction. 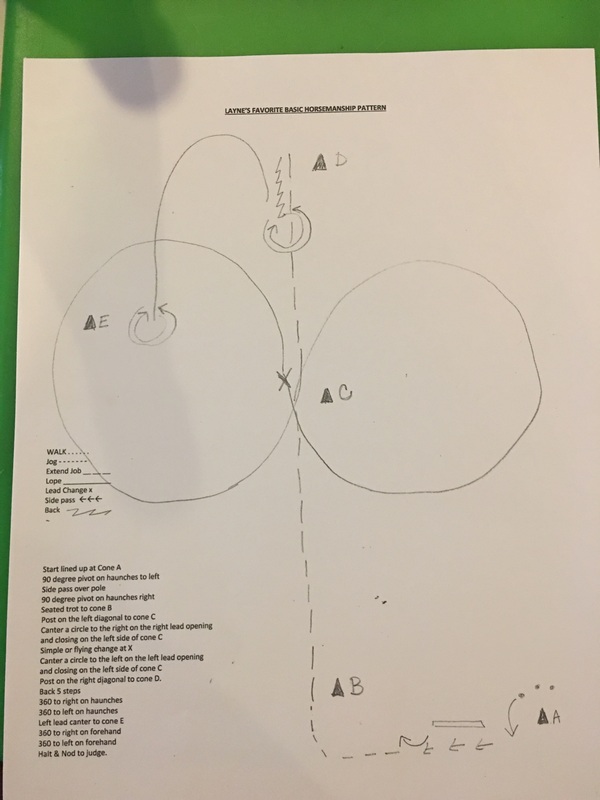 First, we worked on moving Dunnie’s hip at the walk (something we’ve also been working on since we came back from the show and which I’ll write more about soon). Once we got that down, he suggested that I try the lead change again, but this time to have a little more propulsion to my lope. It worked right away; Dunnie gave me such a smooth, pretty lead change that I almost didn’t know it happened until the clinician smiled and congratulated me. Since this was the one element I had any concern about in our reining pattern going into the show, I was really pleased and grateful to have learned a fix for it. The reining class on show day was the culmination of an extremely long, insanely delayed day full of “hurry up and wait.” We got up at 6 a.m., got to the show grounds by 7:45, and I was up on my horse (and waiting in the sun) for my first class at around 9:30. My last class, the reining class, was originally scheduled for around 4–5 p.m.; I actually rode close to 9 p.m. By that point, everyone was hot and drained and also worrying about getting everything cleaned and packed up so that we could leave at a reasonable hour for the 1.5-hour-long drive home. I hadn’t had any dinner, but my blood sugar was saved by one of the barn moms giving me all her remaining peanut m&ms. I just wanted to shower off the 10 gallons of sweat on my body and go to sleep. But I was also really excited about the reining class, and once I got up on Dunnie and was sitting in that chute waiting for our number to be called, everything that had been so hectic and out of control and confusing and stressful all day just turned instead into a feeling of buoyant confidence and focus. We entered the ring at a collected trot and any last concerns I had about Dunnie being there with me were gone. We stopped in the center, waiting for the signal from the judge to begin. From a stop, when we picked up our right-lead canter, everything was amazing. I’d done that same pattern with Dunnie a million times at home; some days were pretty good, some were a little messy. But it had never felt the way it did at the show. It was like being in the show arena woke something up in him and he was just on. I was feeling it too, and while it was happening it was somehow simultaneously hyper-real and dream-like. Pretty much all of it was better than we had ever done it before, including nailing the lead changes and even getting a little bit of a slide on some of the stops. It was thrilling. There’s a video of it, and when I first had the chance to watch it I actually dreaded doing so a little bit, because I was worried that it wasn’t going to look as good as it felt. But I was so happy to see that it did! Right after I finished my round, I jumped off Dunnie, threw my arms around his neck for a huge hug, and then basically put him right on the trailer. We left right after that and got home at 11 p.m., at which point I crashed harder than I can remember doing in a very, very long time. Because we left so quickly, I didn’t get a chance to see any of my scores. I think that SHOT will eventually post them online, and I’m looking forward to seeing them (or at least the reining score) so I can learn where to improve for next time. Now that we have our first show under our belt and have dealt with all the newness and uncertainty which that entails, I can’t wait to do it all again and do it better. Me and Dunnie at the SHOT show in Bryan, TX.